• The term ‘fullerenes’ describes molecules composed entirely of carbon, such as graphite or diamond, which can assume different geometric shapes. C60 fullerene, with a sphere size of less than a nanometre, resembles the trademark geodesic domes of architect Buckminster Fuller, hence its name “buckminster fullerene”. C60 fullerene is a pure molecule composed of 60 carbon atoms. • Discovered in 1985 by three scientists (Harold Kroto, Robert Curl and Richard Smalley), a discovery for which they were awarded the 1996 Nobel Prize for Chemistry, fullerenes are found in nature as well as in space. They can be generated naturally in small amounts during combustion and lightning strikes, or produced synthetically such as in graphite vaporisation in an inert gas atmosphere. 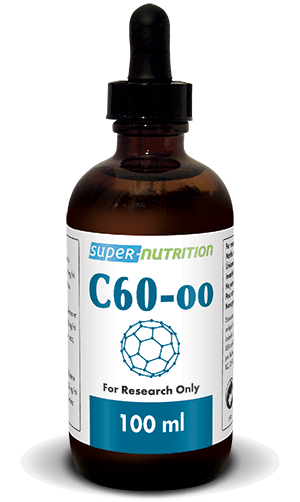 • Compared with calorie restriction or rapamycin-based treatment, which prolong life expectancy by between 15% and 20% (a significant increase in itself), supplementation with C60 fullerene was shown to extend rodent life span by 90%! This crucial discovery was made in a study, published in April 2012, by Professor Fathi Moussa (Professor of Analytical Chemistry at the University Paris-Sud, Orsay) and Tarek Baati (from the Faculty of Pharmacy at the CNRS Châtenay-Malabry), in which they repeatedly administered suspensions of C60 fullerene in olive oil. They noted that in addition to a total lack of toxicity, C60 fullerene almost doubled the rats’ lifespan with no incidence of cancer observed, as compared with controls. • C60’s toxicity was tested by suspending it in olive oil (0.8mg per ml). Olive oil was shown to be the best transport medium and an ideal solution given that the lipophilic C60 fullerene dissolves very poorly in water. The researchers observed a complete lack of toxicity at doses of up to 1.7mg per kg of bodyweight. • These astonishing results have been linked both to a decrease in oxidative stress, as well as to the remarkably complete absorption of theC60 fullerene by the gastrointestinal tract and its total elimination within a few tens of hours of absorption, mainly via biliary rather than urinary routes. • An earlier study published in 2008 had already shown that it increased mouse lifespan and reduced age-related cognitive decline. • In 2011, a further study demonstrated its benefits on growth and lifespan in primitive organisms such as green algae and various species of Aspergillus fungi. • Its minute size means that C60 fullerene easily crosses the blood-brain barrier. This is an exceptional property that could lead to many medical applications, particularly in the nanomedicine field, through the development of new active ingredients that can be delivered into and used by the brain. C60 fullerene is thus emerging as a highly promising treatment for a range of neuronal problems. • Ongoing studies also show that it delays symptoms of amyotrophic lateral sclerosis (ALS) and its antioxidant capacity could potentially confer neuro-protective effects against Parkinson’s-type degenerative diseases. C60 fullerene can indeed eliminate superoxide anion and hydrogen peroxide (H202) and inhibit lipid peroxidation. • C60 fullerene may even come to be regarded as an active element in Alzheimer’s treatment, since researchers have shown it combats aggregation of beta-amyloid protein and degeneration of pyramidal neurons in the hippocampus. This could lead to the development of new cerebral-application drugs that combine antioxidant and anti-aggregant properties. • Fullerenes are also emerging as powerful carriers of conventional drugs, enabling more precise tumour targeting in cancer treatment for example, due to their autophagic effects on cancer cells. • A study carried out in 2011 showed that C60 fullerene in solution, at a dose of 5mg/kg, not only inhibited the growth of a transplanted lung cancer tumour by more than 76%, but also had an anti-metastatic effect of almost 48%. • Due to its efficacy in penetrating the virus cavity, C60 fullerene prevents viruses from replicating, particularly in the case of HIV and cytomegalovirus. • C60 fullerene has also been shown to act as an inhibitor of allergic response and could potentially prevent inflammatory diseases such as asthma, inflammatory arthritis and multiple sclerosis by inhibiting increases in IgE and the release of histamine in vivo. • Using histopathological controls and biological tests, researchers have also shown that, in a dose-dependent manner, it exhibits hepato-protective activity against free radical induced damage, from carbon tetrachloride poisoning, for example. • Many other avenues of research into the potential applications of this compound are currently being investigated, such as those linked to its interaction with cell DNA. Research has clearly demonstrated that it binds to DNA and may affect gene expression, protein shapes and cell morphology. It binds to microtubules and can affect their forms and multiple functions. Results are as yet incomplete and unreported. • To date, C60 fullerene carbon solution in olive oil - the same as that used in the rat longevity study - is the best-known and most widely-used oral solution. It is guaranteed filtered, centrifuged and free from solvent residues. • C60 fullerene is not yet expressly authorised for human consumption but given its proven lack of toxicity, the decision to take it may be a matter of personal choice, from the perspective of increasing your own longevity or that of your pets. Its use with humans remains experimental which is why it is only sold for the purposes of research. To induce such powerful organic changes, it is logical to suppose that other - as yet unknown - biological factors are likely to exist which could make C60 fullerene one of the most important advances in the quest to extend human life expectancy.